In food processer blend oats until it looks like a flour, add walnuts and blend for 10 seconds, add tahini, vanilla, cinnamon, salt, and honey (start with ¼ cup honey and add to desired sweetness). Blend until it becomes dough. 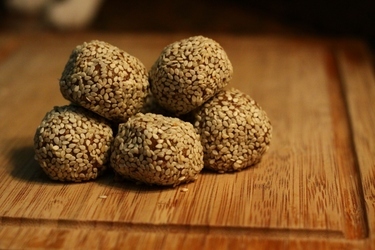 Shape into desired size balls and roll in sesame seeds. Place in refrigerator. This entry was posted on 06/02/2012 by glutenfreeuae in Recipes, Sweets and tagged gluten free, glutenfree, oats, tahini.